Stress can have devastating effects on your health! Back to Living Chiropractic is the only place in New Zealand you’ll find the NeuroInfiniti™ Stress Response Evaluation. 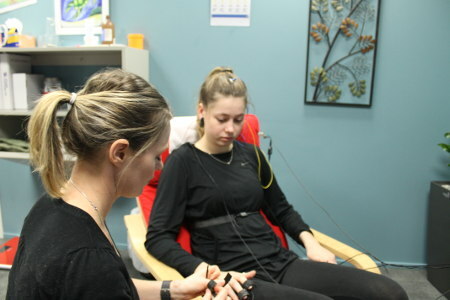 This pain-free neurophysical evaluation uses cutting-edge technology to effectively and accurately evaluate how your nervous system handles stressful situations and its ability to regain a non-stressed state. Neurologically based chiropractic is focused on the nervous system as the key to health restoration and peak performance. Stress is something we all face on a day-to-day basis. But stress isn’t what happens to us. It’s how our minds and bodies respond to what happens to us. It’s healthy to be able to respond to stress. It’s also important that our bodies are able to turn off the stress response, returning to a normal, calm state. This response is regulated by the nervous system. Living in today’s society means far too many of us are turning on that stress response too often and for too long. Our nonstop lifestyles mean this stress response is inappropriately kicked into high gear and for longer than necessary. You could be in a fight-or-flight response far too often to be healthy. We’re here to increase your ability to respond to the demands of your life. When the brain and nervous system are in balance and able to respond appropriately, you’ll thrive in your world! Our friendly chiropractic assistants will perform the computerised assessment in our office. Then one of our chiropractors will interpret your results and correlate any findings with your specific health history. We’ll be ready to discuss your results from you on a follow-up visit. At the follow-up visit, we’ll also discuss a care plan to address any issues we’ve uncovered. Let us help you adjust to the stress in your life. Contact us today to schedule your appointment!